Founded in 1977 in Paris, La Maison du Chocolat is world renowned for its exquisite chocolate creations. Among the shop's most coveted treats are its silken pralines and creamy, delicately flavored ganaches. This gift box offers a sampling of both confections. Premium chocolate is made from special house blends using carefully selected and roasted cacao beans. Assortment includes various milk and dark chocolates; pralines rich with the flavor of roasted almonds and hazelnuts; and luscious milk and dark chocolate ganaches in subtle flavors including lemon, raspberry, fennel, mint, rum raisin and coffee. 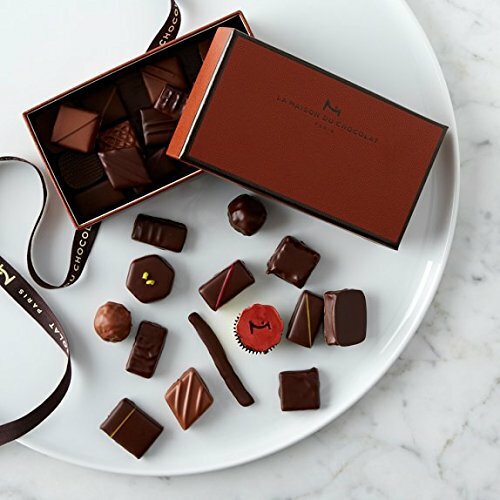 Chocolates arrive artfully packaged in La Maison du Chocolat's signature brown box with ribbon. Made in France and shipped fresh weekly to the U.S. 1/2 lb. (approx. 28 pieces). If you have any questions about this product by La Maison du Chocolat Assorted Chocolates, contact us by completing and submitting the form below. If you are looking for a specif part number, please include it with your message.